At Commack Road we have two choral performing groups: The CRES Chorus and the CRES TrebleMakers. Both are conducted by Mr. Baur. Students may be a member of Band or Orchestra and also participate in the Choral Program. Rehearsals are scheduled so that there is no overlapping of student commitment. The CRES Chorus is an unauditioned group to which any student may be a member. The goal of CRES Chorus is to proide students with an introductory experience with choral music. 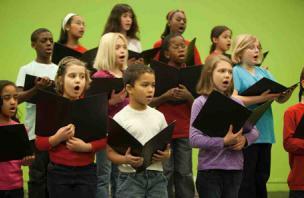 Proper posture and singing technique is emphasized. Rehearsal time is divided between performance of literature and development of vocal musicianship skills and literacy. Time commitment is two mornings before school each week beginning at 8:30am. The group performs three times throughout the year. More information will be provided upon a student joining. The CRES TrebleMakers is a smaller, audition only, choral performing group. Students who are interested in joining TrebleMakers must also be a member of CRES Chorus and participate in a before school audition in June. This is an additional commitment on behalf of the students. In addition to the two morning CRES Chorus rehearsals each week, TrebleMakers will have additional rehearsals on Friday afternoons. The goal of this choral group is to provide advanced level singers an opportunity to learn more advanced choral literature and to have additional opportunities to perform outside of school. More information will be provided upon a student being selected for this group.